Employers across Canada now have concrete proof of the many advantages of hiring newcomers. The Diversity Dividend: Canada’s Global Advantage report, which was launched for BC audiences on October 30, 2017, outlines specifics on how Canadian businesses are benefiting from hiring immigrants. 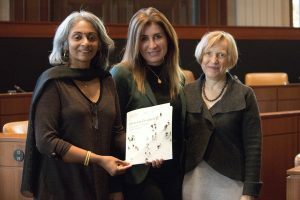 The report co-author Dr. Bessma Momani, who is Professor at the University of Waterloo and the Ballsillie School of International Affairs, said findings show that, on average, a one percent increase in ethnocultural diversity resulted in a 2.4 percent jump in revenues and a 0.5 percent boost in workplace productivity. The potential market inherent within a more diverse workforce is something that policymakers should pay attention to and employers should embrace, she added. 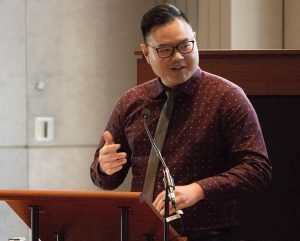 The report findings were presented at the Unlocking the Diversity Dividend in BC event, co-hosted by the Immigrant Employment Council of BC (IEC-BC), RBC Royal Bank and SFU Public Square, with financial support from the Pierre Elliott Trudeau Foundation and the Global Centre for Pluralism. “We’re at a critical juncture in Canada when we are making a decision about what kind of society we want … and whether we celebrate our diversity, promote inclusion and generate prosperity for all,” said report co-author and former ambassador Jillian Stirk. The event, which brought together over 100 representatives from business, government, academia and front-line settlement services, was moderated by Sobhana Jaya-Madhavan, AVP of external relations with Simon Fraser University. Along with the presentations of the key report findings, the agenda included a panel discussion about how to address challenges facing immigrants in the Canadian workforce. Another panellist was Kamal Al-Solaylee, bestselling author and associate professor at Ryerson University. He spoke about lack of diversity in his industry – journalism and publishing and stressed the need for more scholarships and subsidized training to help immigrants and refuges re-qualify for jobs and have a better chance at being able to practice in their new home of Canada using the skills they acquired abroad. “If you have for your whole life trained to be a doctor or an engineer, and that’s your sense of self-worth and identity, it’s really important not to rob you of the chance to live up to that identity,” he said. The third panellist, Marija Radulovic-Nastic, vice-president of central development services at Electronic Arts, spoke about the advances made in the software industry. “The fact that we can easily accept people from other countries that are in the same field without forcing them to go through any special kind of accreditation is what makes the software industry an industry that’s flourishing,” she noted. According to the Diversity Dividend report, in IT, the 1 % increase in ethnocultural diversity has been associated with a whopping 6.2% boost in revenue. However, the gender dimension in IT remains a huge problem, Radulovic-Nastic noted, as this sector is still predominantly male. To compete globally, Canada needs immigration to fill a gap in the workforce caused by a declining birthrate, Momani said. Diversity in the workplace also leads to new and innovative ideas, which can add to Canada’s competitive advantage. Many of the panellists and presenters agreed that Canada is doing a good job of being multicultural, but is falling short when it comes to diversity in the workplace. Institutional and unconscious bias, along with challenges associated with straying from the status quo, all present barriers to entering the workforce for many landed immigrants. 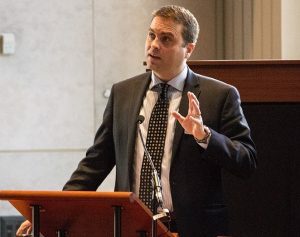 To overcome some of these barriers, it is imperative that newcomers are given a chance to succeed and that employers have access to tools that help them connect with qualified candidates, said IEC-BC’s CEO Patrick MacKenzie. MacKenzie highlighted the importance of shifting perspectives in the workforce to embrace changes in the global economy and tap into diverse talent pools. One such tool is IEC-BC’s BC JobConnect, which was launched in February 2017 to connect employers with newcomers to Canada. Employers can easily browse the online database of over 400 new immigrant and refugee profiles to identify candidates who could fill vacancies at their firms. Demash Kristanto, human resources specialist with Ingram Micro, had a chance to use BC JobConnect to find new hires for his company and echoed this opinion. He spoke at length about the tool’s many advantages, noting that it is designed to help businesses achieve success. In closing, Jaya-Madhavan thanked the audience for their attendance and encouraged them to sign up for BC JobConnect to help them with recruiting employees who are new to Canada. YOU CAN READ THE FULL TEXT OF “DIVERSITY DIVIDEND: CANADA’S GLOBAL ADVANTAGE” HERE.